The mission of CatholicMatch.com is to help its members experience “faith focused dating and marriage,” and it has been fulfilling that mission since 1999. CatholicMatch is a dating site designed to help Catholic singles meet one another on equal faith and belief grounds. Our CatholicMatch review isn’t just based on our experiences, but the experiences of the 1 million worldwide users. From its enhanced features to its ease of use, the use of the site as a safe, worthwhile place to find a partner is highly recommended. 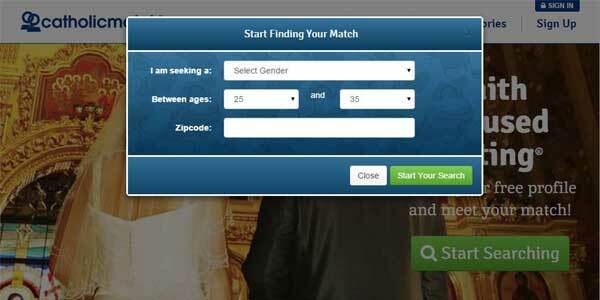 Before subscribing to CatholicMatch.com, you will be able to browse the profiles of other users who live in your area. Afterwards, depending on your subscription plan, you will be able to browse through the forums and chat rooms, and message other users one-to-one. As of 2014, CatholicMatch optimized for any mobile or tablet device, although it doesn’t have its own app - yet. In addition, instead of using only algorithms to mix and match its users, CatholicMatch.com supports the steady development of a relationship. The site provides chat rooms, forums, and blogs where the users on CatholicMatch.com can interact and discuss their faith in a solid Catholic community. 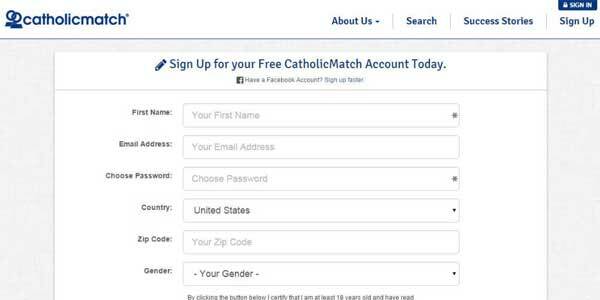 For the CatholicMatch login page, the sign-up is quick and easy. You are encouraged to fill in your first and last names, your email address, country, closest city, birth date, gender, and marital status. On the other hand, you can make it much easier for yourself by signing in with your Facebook account instead. Rather than giving resources that measure compatibility, CatholicMatch.com is more concerned with its users being matched with other users who share their values and depth of belief system. There are the traditional profile-filling questions on appearance and gender, but then they get deeper. They ask for marital status (important because Catholics cannot marry after divorce, only annulment), if you accept the Church’s teachings on the Eucharist and other doctrinal points, and how often you attend mass. In this way, users can search for other Catholics whose fundamental beliefs align with their own. Because of the strict rules of CatholicMatch.com on behavior and messages on the site, it actually makes this online dating platform quite safe. Profanity is banned, as are different forms of abusive language, and provocative photos are not allowed into profiles. Since scammers tend to use these, it is relatively easy for the site to identify them and take their profiles down. CatholicMatch.com also puts safety so high on their lists of priorities, that they take down profiles of users who give out their email addresses, mobile numbers, home addresses, personal URLs, and even social networking or personal messaging IDs on the site. They also penalize those who request such information. In that way, they also remove the email addresses made public. The other side of the safety features is that CatholicMatch.com makes sure that the publicly shared messages and articles are consistent with the Catholic faith and teachings. The guidelines are as detailed as “no Horoscope signs.” This makes the site “safe” for users, lowering the risk of offense and insult in the solid community. There are 3 paid options for CatholicMatch subscriptions as well as a free option. This allows the users to join the community of Catholic singles in the forums and the chat rooms as a reader, and to browse through the profiles of other users. They can only read the community pages, and their one-to-one messages are limited to emotigrams. The next option is to subscribe per month, at $29.95. Users can send one-to-one messages, personalized emotigrams, post messages in the community forums, join the community chat room discussions, and receive priority support from the site managers. The prices become more affordable, the longer-term the subscription plans are. For a 3-month plan, the payment is only $19.95 per month, or $59.85 for 3 months. It is billed through a one-time payment, and you basically save 33% on the overall price. 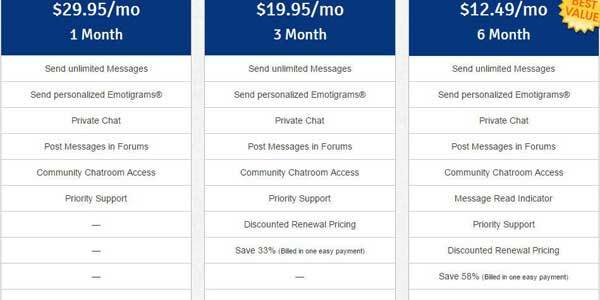 The last subscription plan lasts 6 months and costs $12.49 per month, or $74.94 for 6 months. This plan allows you to see if the messages you’ve sent have been read (much like the Facebook feature). It also has the CatholicMatch Guarantee, which gives active users on the 6 month-plan an additional 6 months for free, if they were unable to meet anyone yet. You also save 58% on the original per-month price. Right after signing up the rather long sign-up sheet, you are asked a number of questions with boxes to tick off. These are simple, such as height, eye color, hair color, presence of tattoos or piercings, and so forth. The next question appears after the answer to the previous one was ticked off. It is easy and quick to fill out in this way, but the questions are deep and detailed, asking for your agreement or disagreement on issues such as contraception, abortion, and other Church teachings. You can also give a personal statement about yourself, and then fill in other fields on Favorites, Hobbies, Faith, Reading, and so forth. To begin finding Matches, you should fill out a pre-test that will let CatholicMatch.com know how to suggest profiles for you to view. The user page is simply designed, with the Institute blog at the side and overall site activity there when you scroll down. It tells you about new users, what’s new on the chatroom and forums, and other simple community details. The more site-provided questionnaires you fill out, the more profiles will be suggested to you for review. The site tries to keep the profiles to your geographic location and within a few years of your own age. When you search a match, you fill in the basic criteria you are looking for, and CatholicMatch.com will give you the range you want. CatholicMatch.com is a perfect choice for Catholic singles who want to bypass all the confusion and stress of finding a Catholic match with similar fundamental beliefs on a mainstream online dating site. Users on this site can jump straight to the significant details, and look for their perfect matches in an online dating community supportive of their faith and beliefs. Not sure if CatholicMatch is the right dating site for you? Check out the Christian Mingle - another popular dating site for Christian singles.